Is holiness a missing element in evangelical theology? That’s what Gordon T. Smith says in the opening chapter of his recent book, Called to Be Saints: An Invitation to Christian Maturity. Smith points to an observation made by Richard Lovelace in the late 1970s “that evangelical theology and spirituality were marked by a ‘sanctification gap’” (14). Lovelace traced this to evangelicalism’s emphasis on revivalism where the focus was on conversion leaving Christian maturity and holiness to be treated as secondary matters. Smith suggests that the gap remains and substantiates the case in part by pointing to the fact that theology texts in evangelical seminaries tend to give holiness superficial attention. When sanctification is in view, Smith observes, the interest is in how not when. That is to say, attention is given to the process of sanctification, not the goal or end of sanctification (14-15). He believes we need more than that. Reading Smith as a pastor steeped in Wesleyan theology, I cannot help but think of John Wesley’s conviction, articulated in a letter near the end of his life, that the doctrine of entire sanctification “is the grand depositum which God has lodged with the people called Methodists; and for the sake of propagating this chiefly he appeared to have raised us up” (Works, XIII, 9). You might say that Wesley perceived a sanctification gap in 18th century English Christianity, and he was persuaded that God had specifically called and equipped the people of the Methodist movement to fill the gap. To that end, he rode countless miles on horseback to preach thousands of sermons and organize communities of worship and accountability committed to growing in grace and maturity that intentionally pursued, not just sanctification, but entire sanctification. For Wesley, that’s what it meant to be Methodist. Fast-forward to the 21st century and you’ll find a Methodist family tree with no few branches. The denominations that trace their heritage to Wesley are many and varied. Some embrace robust teachings on holiness. Others don’t emphasize it quite as much. Within my own branch of the Wesleyan family tree – The United Methodist Church – we have a number of tribes with distinct subgroup identities, but we are largely without a widely held sense of identity on the denominational level. The theorists would say that we have a number of competing subgroup identities but lack a superordinate social identity that cultivates and maintains a sense of coherence between the subgroups. We’ve got high church folks, low church folks, mainliners, progressives, and evangelicals. The point there is to illustrate the range of groups, not provide an exhaustive list of UMC subgroups. All that to say, the UMC is a denomination without an identity, and we are feeling the anxiety and the pain that comes with that. My hope is that we will be able to recover the identity that Wesley left us: we are the people called by God “to spread scriptural holiness over the land.” The reason there are Methodist churches all over the world with so many branches on the Wesleyan tree is because John Wesley believed with all his heart that God raised up the people called Methodist to revitalize the Church with the message of holiness for the life of the world. That is who we are. That is our identity. That should be our mission. Because that is what it means to be Methodist. It’s our vocation to fill the sanctification gap. Can we fill the gap? But how do we do it? What disciplines and practices and strategies have to be in play to pull this off? There are several key pieces. And at this point, I’m moving beyond the UMC to think in terms of the wider Wesleyan world. It’s not clear that the UMC will ever succeed in forming a unifying identity. I should add that I’m not suggesting any of this is new information. Lot’s of folks are thinking about this. I’ve been involved in dialogue about this sort of thing for years. Here are a few things that keep coming up. 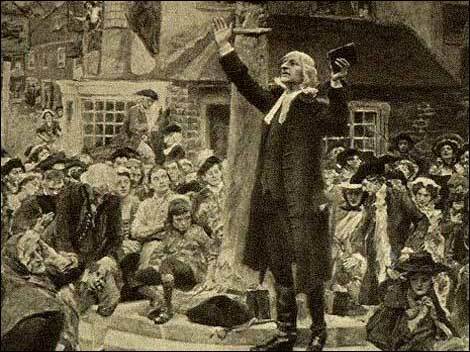 Preaching – Wesley believed that every Methodist preacher should preach the doctrine of holiness. I’ve heard the observation made many times that the doctrine of entire sanctification is seldom preached these days. This could be for a variety of reasons. Maybe we are unfamiliar with it. Maybe we don’t understand it well enough to preach it confidently. Maybe we are afraid of being misunderstood. Maybe we don’t believe it. Whatever the reason for the lack of homiletic attention to the doctrine of holiness, if we are going to forge and maintain an authentic Wesleyan identity, then we must have clear and robust preaching on holiness. Singing – The observation has been made that the Methodist movement would never have made it with John’s preaching alone. Charles Wesley’s hymns were essential for planting the seeds of holiness in the hearts of the early Methodists. Not only do we need to be singing our own Wesleyan hymns about holiness, we need a new generation of songwriters who can ably transmit holiness theology melodically and lyrically. Small groups – Wesleyans did small groups before small groups were cool. The movement happened because the people involved were involved with each other at deep levels. They didn’t just worship together; they got deeply entrenched in one another’s lives. They cared for each other. They got in each other’s business, and they did it for love of Christ and love for one another. And if someone didn’t show up a couple of times, they went looking for that person. This is essential. We can’t be Wesleyan without deeply committed small groups explicitly focused on growing in holiness and entire sanctification. Theologians – We also need theologians who can write the books and give the talks that lead the Church in thinking about entire sanctification. Some of these folks might be academic theologians; others might be pastor theologians. We’ve got some good folks out there doing this kind of work, but this is one of those things where there’s never enough. And there’s the question of who will receive the baton from the current generation of theological leaders in the Wesleyan tradition. Who will embody this key vocation as we move into the future? Conferences and publishers – I am encouraged by the birth and growth of Seedbed and the New Room Conference. This sort of thing is going to be essential for connecting people of like heart and like mind around the topic of holiness. It’s also essential for helping us discover new resources and develop a sense of group identity. Let’s keep it growing. All five of these center around our ability to speak and write about holiness with care, wisdom, clarity, and faithfulness. At the end of the day, we’ve got to be talking about holiness…a lot. So much that when people see us coming, they think “here come the people who talk about holiness.” And our speaking must be filled with passion that is compelling and contagious. If we can do this, then we will be well on our way to filling the sanctification gap and recovering our God-given vocation to bless the Church and the world with the good news that God’s grace is more powerful than the sin that besets us. Your turn: Do you perceive a sanctification gap? What evidence do you see for a sanctification gap? What must we do beyond the 5 keys mentioned here? Is holiness essential to Wesleyan identity? Leave a comment with your input.